ORANGE WALK TOWN, Mon. July 31, 2017–Former campaign manager for Orange Walk North area representative Hon. Gaspar “Gapi” Vega, Hilmar “David” Alamilla, 42, has been arraigned for the murder of Orange Walk resident Daniel “Danny Boy” Sosa, 24. Alamilla, represented by attorney Richard “Dickie” Bradley, appeared before Senior Magistrate Albert Hoare in the Orange Walk Magistrate’s Court today. He was read a single charge of murder and remanded to the Belize Central Prison until September 5, 2017. Alamilla was escorted to the court house by 9 police officers. The Officer Commanding Orange Walk police, Supt. David Chi, told the media that this was done for security reasons. However, he denied any involvement in preventing the media from entering the court for Alamilla’s arraignment. Chi maintained that Alamiåla was not receiving preferential treatment because of his political connections. Information to Amandala is that the deceased had spent the last moments of his life partying with Alamilla and two other men. 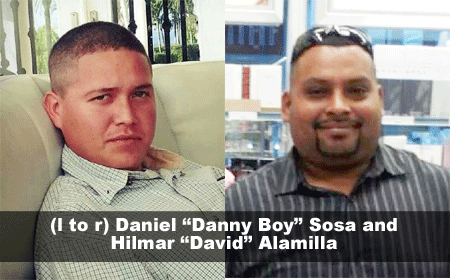 The four men had left Hi5, a popular nightclub in Orange Walk Town, in Alamilla’s truck at around 5:00 Saturday morning, when a single shot inside the vehicle killed Sosa. Sosa, who was seated in the front passenger seat, was hit in the left temple, the bullet exiting the top of his skull. Police found his body in the parking lot of the Dvictoria Hotel in Orange Walk Town. Police were called to the scene and they saw him lying face-down on the ground and bleeding profusely. Sosa was certified dead by medical officials at the Northern Regional Hospital. Alamilla and the two other men in the vehicle were subsequently detained for questioning. Police, however, refused to confirm where exactly the shooting took place, except that it took place in a moving vehicle close by, and Supt. Chi would not confirm whether the murder weapon had been found. Supt. Chi also said that Sosa’s body apparently had been dumped where it was found, in the parking lot of the Dvictoria Hotel in Orange Walk Town. He did not reveal the evidence they had against Alamilla to charge him with murder, except to say that they had consulted with the Office of the Director of Public Prosecutions before laying the murder charge, and also, he also did not confirm a report that blood had been found in Alamilla’s vehicle. According to police information, there were no prior conflicts between Sosa and Alamilla. A source told our newspaper, however, that gunshots were heard on the Belize Road in Orange Walk Town, but Sosa’s friends thought nothing of it until they could not locate Sosa. They learned that Sosa was last seen with Alamilla, and so they and other friends quickly visited Alamilla’s home. The source reported that when they arrived there, they met Alamilla leaving his home with a beer, and he was about to enter a waiting vehicle. Alamilla’s behavior made them suspicious, and so they quickly contacted the police. Alamilla had already showered and changed his clothes, the source said. The source said that Alamilla was detained, but he was not kept in a holding cell. Instead, he was kept in an air-conditioned room. Police would not confirm this. Alamilla’s attorney, Dickie Bradley, told Amandala this evening that the shooting was accidental because the vehicle is a stick-shift model (manual transmission) and the gun was by the gear shifter when it accidentally discharged. He also said that “upon advice,” Alamilla did not give a statement to police. If the name Hilmar Alamilla sounds familiar, it is because in January 2013, he was busted trying to smuggle hundreds of rosewood logs through Golden Stream, Toledo District. Upon learning this, former Minister of Forestry, Lisel Alamilla, became angry and set the logwood, valued at $400,000, on fire. Following the 2015 general elections, Lisel Alamilla was not reappointed to Cabinet, but instead was made a senator by Prime Minister Dean Barrow. In 2013, (Hilmar) Alamilla “bought” a privately-owned parcel of land at a heavily discounted price from the Lands Department, which was within the ministerial portfolio of his Deputy Party Leader, Gapi Vega. He thereafter sold the same parcel of land to Vega’s son, Andre Vega, who collected a handsome $400,000 from the Government of Belize when the land had to be reacquired.